The Cambridge Apartments were built in 1923 and at the time, offered nice views. Now, the view is of the south end of the Convention Center and Seattle’s ever-rising skyline. THIS, I BELIEVE, is only the second occasion in which Jean Sherrard, the “now” photographer in this partnership for nearly a decade, has managed to include himself in his photo. Standing on the roof of the 10-story Cambridge Apartments, he appears bottom-right with his head and shoulders sticking out from the building’s shadow, near its pinnacle. 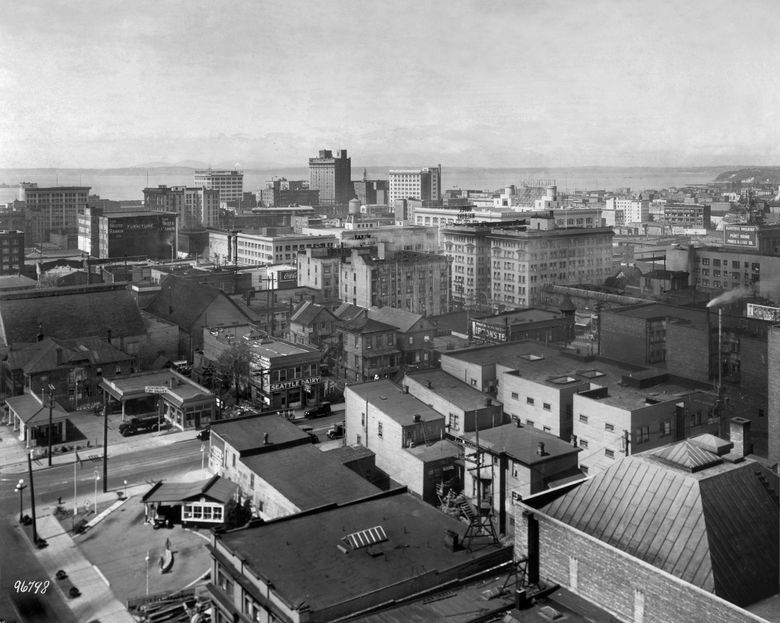 The historical photo was most likely taken in 1923, the year the Cambridge started letting its convenient studio apartments to renters who often worked nearby in Seattle’s new retail section. Dating the photo is helped by the dark-roofed Dreamland Pavilion, on the far left. Dreamland was razed for the Eagles Lodge, which opened in 1925. Bottom-right is another big new roof, with the raised architecture of either a fly loft (above a stage) or a grand hall. Like the Cambridge, Evergreen Lodge No. 2 of the Ancient Order of United Workmen opened its new hall at 1409 Ninth Ave. in 1923. The Cambridge is nestled at the southeast corner of Union Street and Ninth Avenue, with its back to one of the two steepest grades on First Hill. Most tenants enjoyed splendid views toward the Olympic Mountains and Lake Union. These prospects were partially obstructed in the 1960s with the construction of Interstate 5. 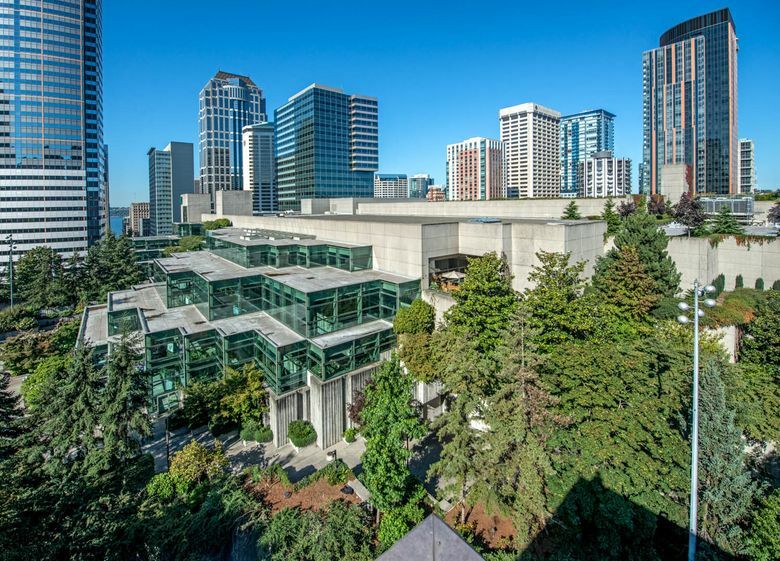 They were then lost in the 1980s with the unwanted embrace of the Washington State Convention Center, which, with its neighbor, Freeway Park, was built on top of the freeway. The sprawling concrete center, through mitigation, helped the city purchase the Cambridge in 1987 for conversion to low-income housing. When Jean first stepped onto the roof, led by Chong Han, the apartment’s live-in manager, he was instantly enchanted. It is from this prospect the terraced architecture of the Convention Center’s south façade, a mingling of greenery and green glass, can be enjoyed and admired. Jean tells me that he and Chong shared visions of roof gardens atop both the Cambridge and the Convention Center. Almost floating above the Convention Center is Jean’s second subject, Seattle’s spreading skyline, heading north for Lake Union down the “Westlake Funnel.” On the subject of our current high-rise habit, readers might wish to return to Lawrence W. Cheek’s thoughtful Pacific NW feature from Sept. 13.